Today's auction of Egyptian, Classical, and Western Asiatic Antiquities at Sotheby's shows that the market is still unsettled. The $5.8 million raised today brings 2009's total to just under $8.6 million. The value of sales in 2008 was $17.8 million. Egyptian antiquities are playing an increasingly small part in the sale, down to 17% in value. This makes 2009 the third lowest component of Egyptian antiquities since 1998. While the median value shows a slight increase on December 2008, the market seems to be back at 2004 levels. The reason may be more complex than the recession. 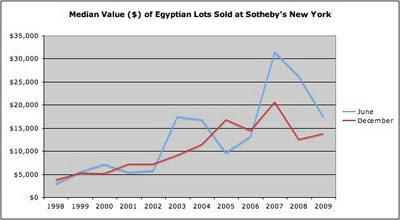 Have the recent actions by Egyptian authorities (and in particular Zahi Hawass) had an impact on the market? One question I have not seen answered is the extent to which anxiety over provenance really does lead collectors to pull out of the market altogether or whether it also leads to an increased interest in well-provenanced pieces, and therefore (at least at the top end where pockets are deep) to an increased competition among buyers for the equivalent of the Guennol lionness, and a spike in prices for those top-end pieces.